Background: Pyrazolones have identified as significant antioxidant agents and many marketed and clinically prescribed NSAIDs have pyrazolone ring as main scaffold. 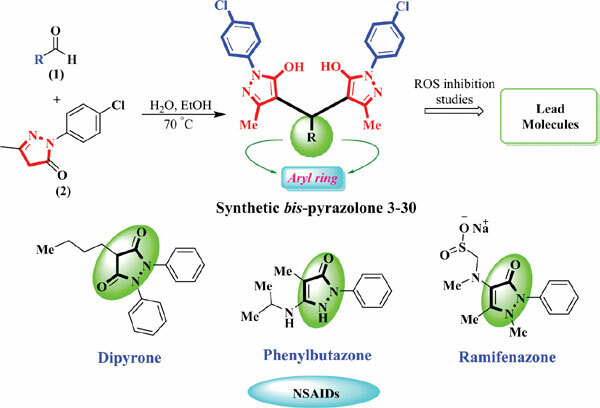 Method: Keeping in consideration the antioxidant potential of pyrazolone scaffold, new bispyrazolones 3-30 were synthesized by a green and enviroment friendly reaction route, in which two equivalents of 1-(4-chlorophenyl)-3-methyl-1H-pyrazol-5-ol were treated with one equivalent of benzaldehyde derivatives without any catalyst. All compounds were structurally characterzied by 1H-NMR and FAB analysis. 13C-NMR of selected compounds was also recorded. All compounds gave satisfactory elemental analyses and found in good agreement with calculated values. Results: Synthetic bis-pyrazolones 3-30 were evaluated for their oxidative burst inhibitory effect of zymosan stimulated whole blood phagocytes by using luminol enhanced chemilluminescence technique. All molecules demonstrated the potent ROS inhibition activity in the range of IC50 = 1.2 ± 0.1-48.8 ± 3.9 µM as compared to the standard ibuprofen (IC50 = 54.2 ± 9.2 μM). The purity of active compounds was checked by HPLC. Conclusion: This study has identified a number of non-acidic lead molecules for future research on ROS inhibitors. Bis-pyrazolone, oxidative burst activity, inflammation, in vitro, reactive oxygen species, chemilluminescence technique.